Produced 10 times a year, this Catholic news magazine is our flagship publication. 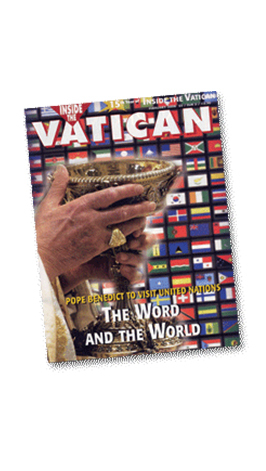 In it, we provide the most comprehensive and balanced coverage available of the Vatican, and thus of the great issues of concern to the Catholic Church. The editorial stance is marked by objectivity. We provide insight into the reason for the actions of the Pope and the Vatican, and this distinguishes us from many secular media outlets which often provide only superficial or tendentious reports. In our pages, you get an insider’s view of Vatican decision-making, with thorough coverage of the great spiritual, cultural and social issues of our time. Recipients include all the Vatican offices, all U.S. bishops, the U.S. State Department, many political and religious leaders around the world, and thousands of Catholic priests, nuns and committed lay people. Current circulation: 13,000 subscribers in over 100 countries. $49.95 per year. We have maintained a web presence for the past several years. The site is developing into a powerful vehicle for a global voice and presence, including high volume e-mail distribution, webcast, podcast, blogging and forum capabilities. In addition, an electronic version of the magazine is in preparation, as well as Apps for reading our news on iPads, iPhones, and other electronic distribution platforms. We offer digital media of lectures, concerts, conferences, symposiums and pilgrimages in the form of CDs, MP3s, DVDs, Podcasts and online video portals. Insightful publication about the spiritual side of Benedict XVI. Our publications include: Before the Dawn, The Catechism of the Catholic Church, Let God’s Light Shine Forth, Pray for Me and others. 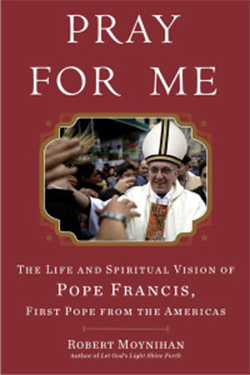 Pray for Me The Life and Spiritual Vision of Pope Francis, First Pope From the Americas. As an astute observer of the human condition, Dr. Moynihan will be launching a new The Moynihan Report to provide an outlet for his analysis of issues not necessarily related to the Church and the Vatican. His keen mind and insight on all current events is a frequent request from journalists and the well-informed worldwide. Stay tuned! These timely electronic reports in e-mail form are a unique analysis of global political, economic, cultural and religious issues from the perspective of a long-time Vatican watcher. The letters contains insights into the meaning of world events as seen from the vantage-point of Rome. These letters reach 20,000 e-mail addresses. You won’t want to miss these reports! Many are archived here. We are committed to helping Western culture to “breathe with two lungs.” Our careful, cautious work is aimed at slowly helping to build up trust and, in God’s time, help to heal the Great Schism between the Eastern and Western Christian traditions dating back to 1054 A.D. Join us in working to defend the West by strengthening Christianity throughout the world through the “soft power” of art, music and, very humbly, prayer. Urbi et Orbi Foundation is organizing projects to demonstrate how Catholics, Orthodox and all Christians can work together on moral values and charitable initiatives through cultural events, scholarly research and publication projects that reveal the richness of our traditions. 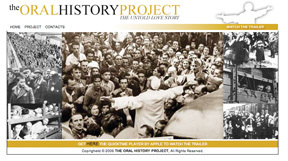 Our first major conference was in September 2008 at The Catholic University of America in Washington, D.C., a three-day conference entitled The Hope of The Promise: An Exploration of God’s Promise to Israel and Its Fulfillment. We are planning lectures and roundtables in Rome, Moscow and Washington. We will keep you informed of all upcoming events. 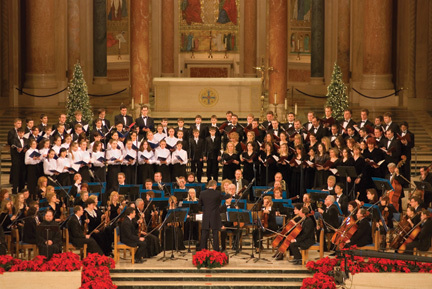 Christmas Oratorio by Bishop Hilarion Alfeyev performed with Vienna Boys Choir, a major Russian Orchestra & the Choir of Moscow’s Tretyakov Gallery in 2007 to help heal the great schism between eastern and Western traditions. Join us in strengthening Christianity throughout the world through the power of art, music and prayer. The goal is simple: to allow Europe to “breathe with two lungs.” How? Urbi et Orbi Foundation is organizing projects to show how Catholics and Orthodox can work together on moral values and charitable initiatives, and on cultural events and scholarly research and publication projects to reveal the riches of our traditions. 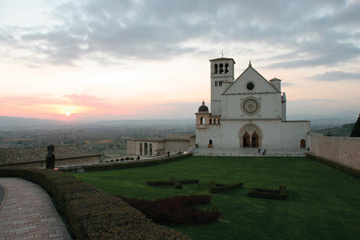 We organize very special, quiet pilgrimages to the heart of the Church. Our small groups, limited to 12, have time for solitude and prayer in extraordinary places with ready access to St. Peter’s Basilica and private visits to Vatican museums and the Sistine Chapel. We stay inside the Vatican walls across the piazza from St. Peter’s Basilica in the Domus Sanctae Marthae, where the Cardinals stay during the conclave. 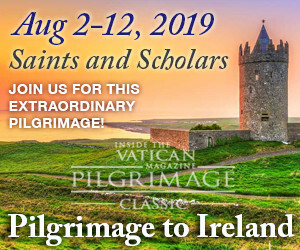 Please join one of our pilgrimages. You may find it the experience of a lifetime! 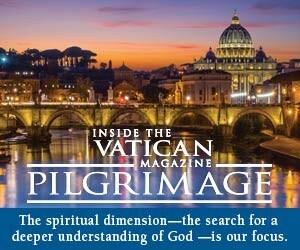 For more information check out the Pilgrimage section of our site. On the morning of October 16, 1943, just at dawn, the German SS soldiers in Rome began going house to house in the Jewish ghetto, arresting Jews. But something unprecedented happened. The Germans only found about 1,000 of Rome’s 10,000 Jews. Almost all of them were hidden in Catholic convents and monasteries, and in Vatican City, next to the residence of Pope Pius XII himself. We are locating these survivors, now in their 70s, 80s, and 90s, and interviewing them. Their stories make up one of the most remarkable and moving unknown stories of the Nazi period. We plan to expand this project to include other historical periods.